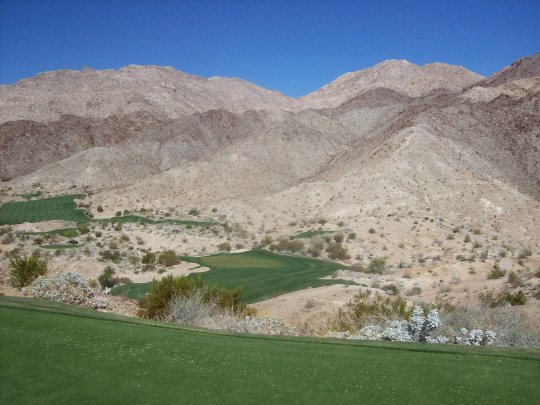 This course has been on my wish list for a few years, since I came across an article about it in Southland Golf Magazine and was intrigued by the photos. 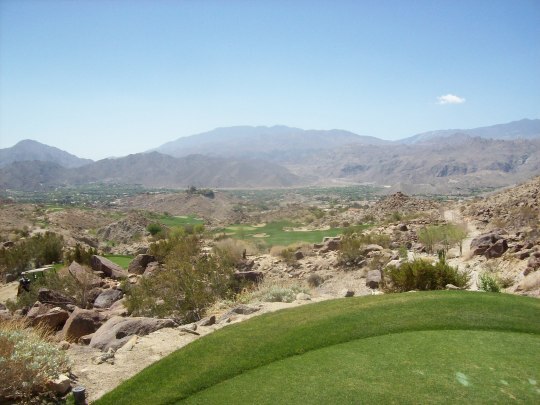 It’s one of the many private clubs in the Coachella Valley that you don’t hear that much about, so it’s always held some mysterious appeal for me. 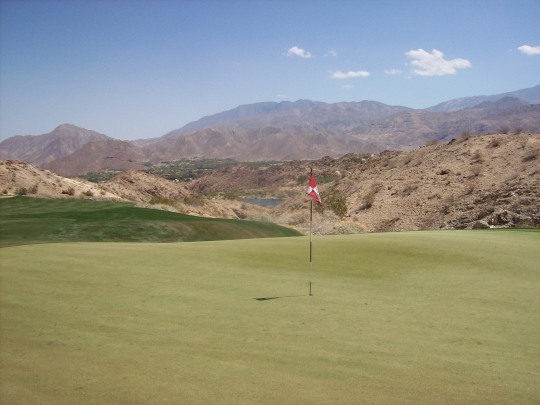 Finally, I got the chance to play there on Tuesday by taking part in another SCGA member outing. They’ve been doing them at Stone Eagle the past few years I’ve been a member, but I finally was able to make the splurge this year. $240 was a steep price tag (right up there with some of the most expensive rounds of golf I’ve ever played), but I had to go for it and satisfy my curiosity. What always interested me about Stone Eagle is how isolated and unique it looked. 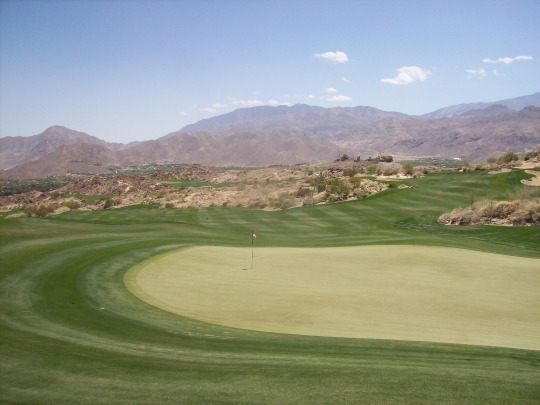 So many of the courses throughout the Palm Springs area have a tendency to blend together with similar “oasis” styling and scenery. 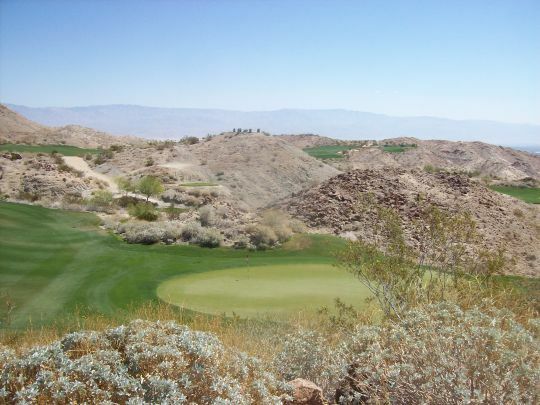 This one embraces more of a rugged desert style that you might find more often in Nevada or Arizona. When you combine that look with a Tom Doak design pedigree, you truly get something special. Tom Doak is the architect behind courses like Pacific Dunes and Old Macdonald in Bandon. He’s known for his creative links-inspired designs and use of the surrounding landscape for a more natural flow with the scenery. Stone Eagle takes this idea into the desert, which is something different than we’re used to seeing. 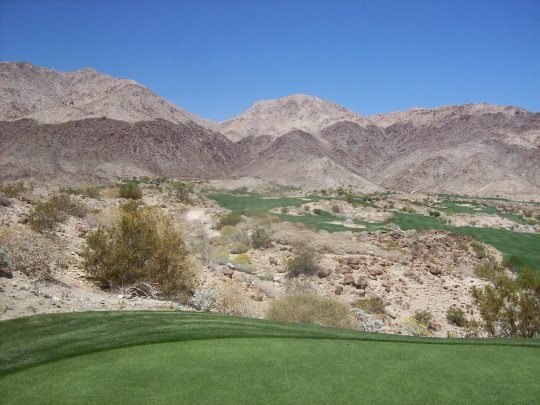 Most desert courses tend to have individual holes framed distinctly by the rugged desert surroundings. Stone Eagle features a more sprawling, amoeba-like approach, where many holes kind of blend together seamlessly and not everything appears to have rhyme or reason. 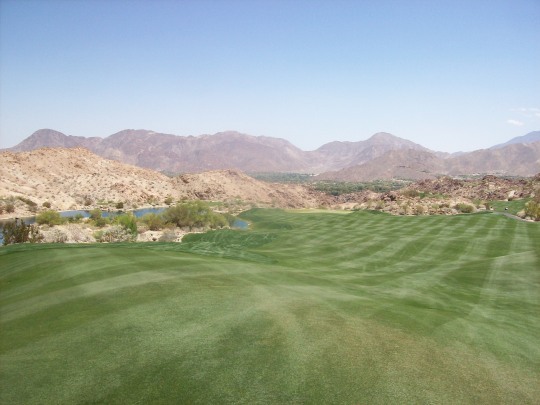 I recommend taking a look at the satellite views of this course sometime and trying to figure out the routing. 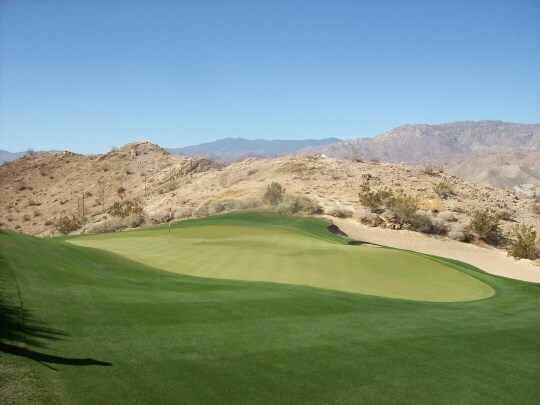 Doak’s biggest design influence for Stone Eagle may have been Rorschach because it’s kind of one big ink blot of beautifully manicured grass on top of this desert hillside’s natural slopes and terrain. 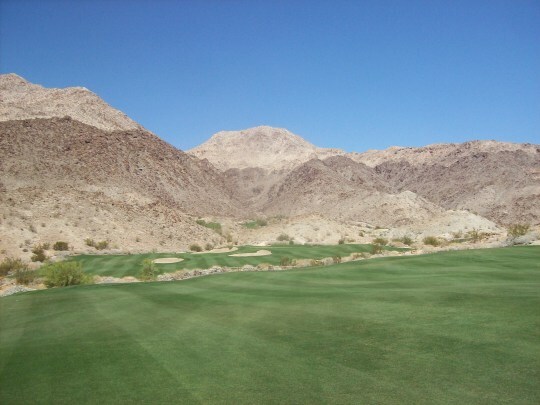 A friend of mine signed up with me and we drove out there in the morning, arriving at the club about an hour ahead of the 9:00 shotgun start that was planned. The staff was extremely friendly and helpful with all the forecaddies getting matched up with their groups and off to the excellent practice area up the hill about 1/4 mile away from the minimal (I’m guessing still “temporary”) pro shop and restaurant. 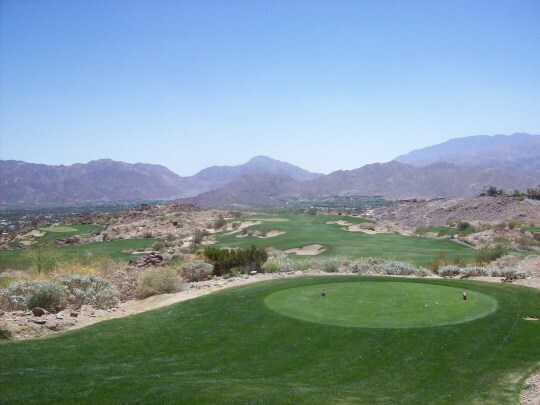 Stone Eagle is just a couple miles south of Highway 111 in Palm Desert, yet it feels miles and miles away from any civilization. From the moment you turn off onto the subtle side road and enter the property, it is very isolated. 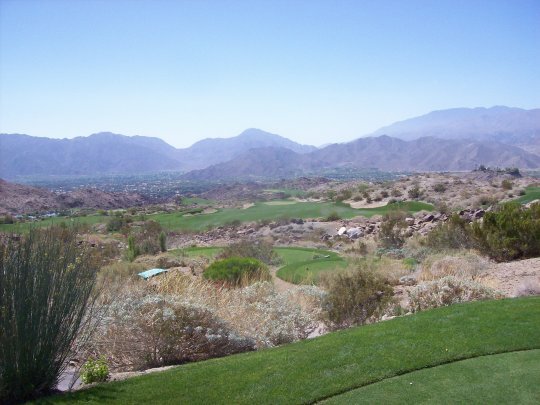 Unlike most courses in this area, there are no houses directly around the course, though you can see a few really nice homes perched up on some of the hillsides just south of the course itself. 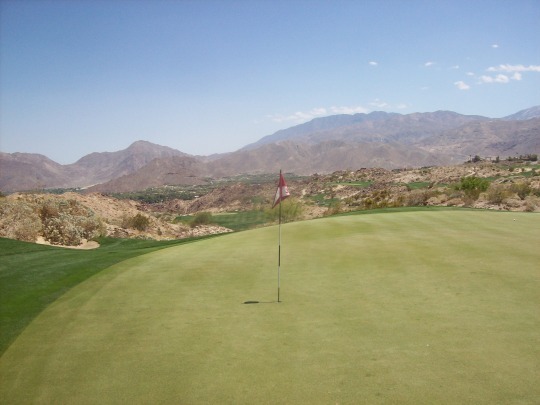 The elevated setting offers some nice views of Bighorn Golf Club to the south and panoramic views of the valley to the east. Our group started on the 6th hole, so we got a little preview of the course as we zig-zagged our way around and made it to our first tee. The routing here is a little tricky and signage is very limited. They want things to feel as natural and minimalistic as possible. The normal members (only around 200 according to our caddie) obviously know their way around anyway, but we were glad to have our caddie showing us the way a number of times. 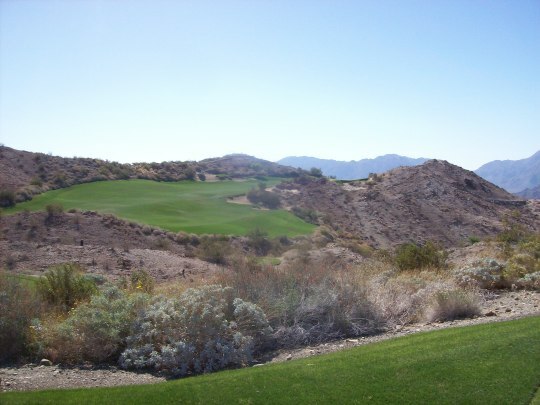 The 6th hole turned out to be one of the trickier holes to get started on as an uphill, dogleg right with more trouble closely in play than on most holes out here that are quite forgiving. 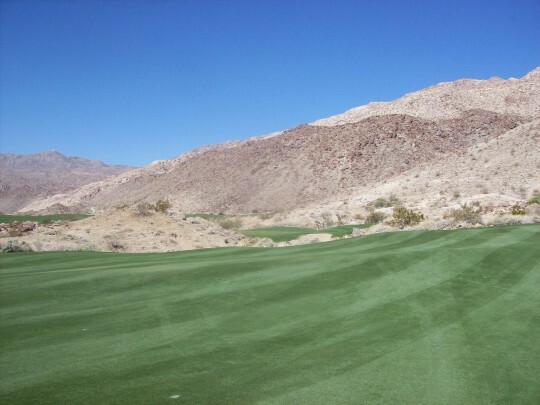 The actual 1st hole is probably the easiest on the course as it’s relatively short and simple to ease you into what will ultimately be a roller coaster round. 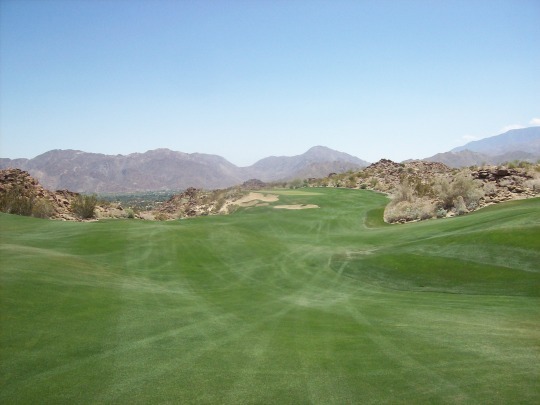 With many of the fairways connecting and all sorts of amorphous run-off areas, tee shots here are very forgiving. Really bad drives can still find trouble and there are still ideal positions you want to be in. 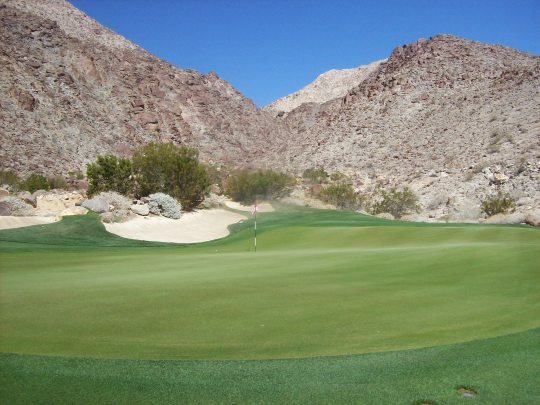 Just because you spray a ball and stay on grass doesn’t mean you’ll have an easy next shot. The greens are Stone Eagle’s biggest defense. These things are nasty, yet fun in a sadistic kind of way. True to Tom Doak’s links tendencies, they are massive and feature all sorts of humps and undulations to contend with. 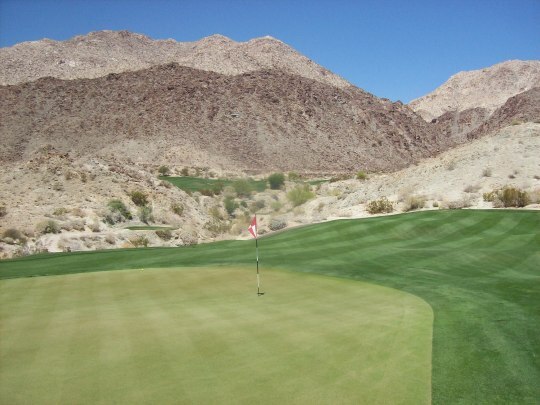 Also, many have multiple false edges to make approach shots and even chips quite tricky. 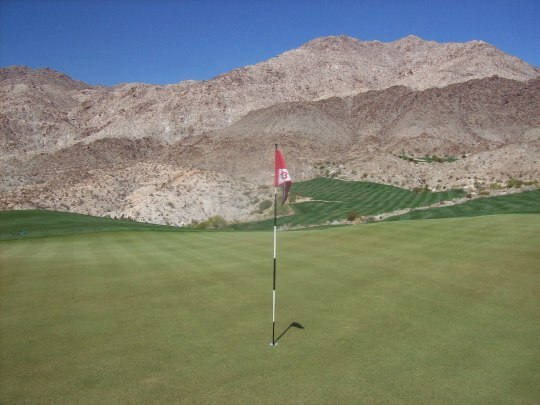 To make things even tougher, the greens were very firm and very fast/smooth, so every short shot was a true adventure. 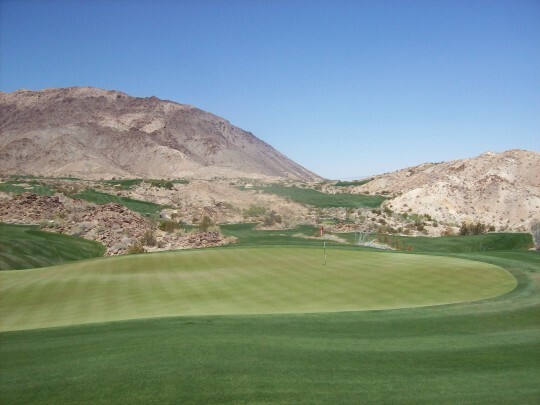 Basically, at Stone Eagle, getting your ball up on or around the green isn’t that tough, but getting it in the hole is a different story. I had my share of three-putts and even a four-putt! As interesting and unique as the overall presentation of Stone Eagle is, the rub against it is that a lot of holes kind of blend together—not just physically, but mentally. This is one layout that, over time, I won’t be able to recall too many specific holes. Each hole offers something a little different in terms of strategy, length and design, but everything has a pretty similar look and feel. Probably the stand-out holes to me are the 4th, 6th, 7th, 12th and 18th. 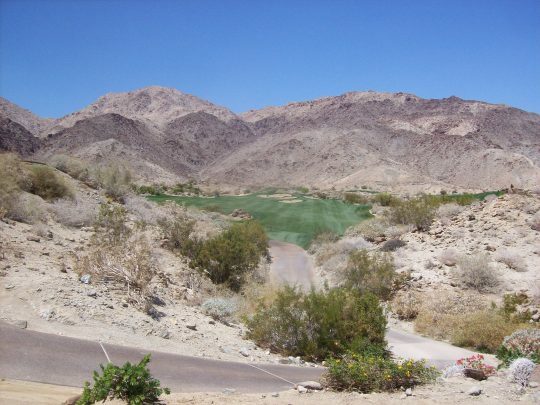 The 4th features the only water hazard on the course (you hit over it on the 5th tee as well) and is easily the “prettiest” hole here because of that feature. The 6th, though not an ideal one to start on, is a really great hole that requires both strategy and execution to score well. 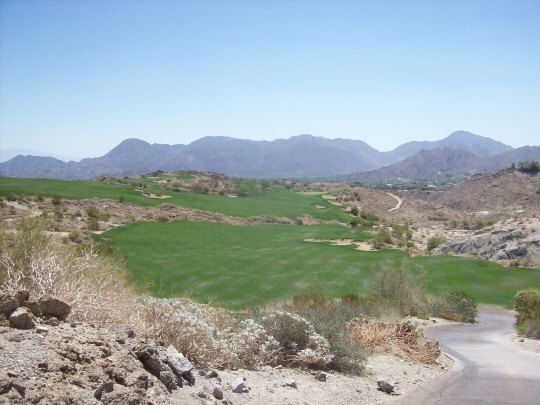 It is followed by a nice, downhill par-3 (the 7th) playing back toward the mountain. The 12th is probably the signature par-3 with a big green complex cut into the hillside at one of the most isolated parts of the course. 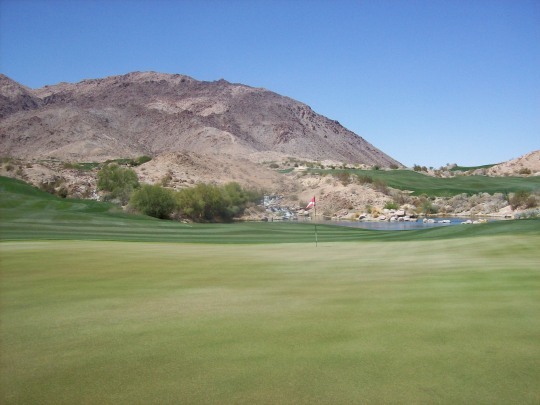 The 18th is a long and difficult finisher. 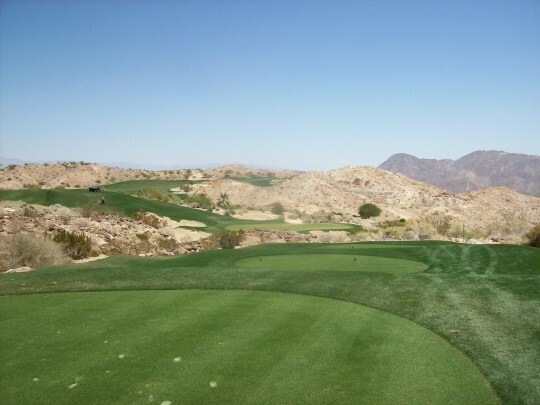 The downhill tee shot will run out nicely, but then you have an uphill approach to a demanding green. Anything left is dead, so your bailout is to the right. As for conditions, Stone Eagle was in exceptional shape all around. Other than the greens being super firm and hard to hold (which is by design), everything else was lush, green and like carpet in most areas. The bunkers did have a lot of little rocks and pebbles in them. 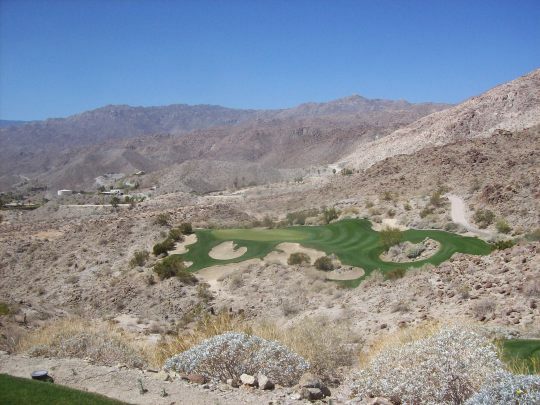 I presume that they can’t keep anything too fine in them because of winds on this very exposed hillside, and in a way, the more coarse bunkers kind of reflect the more gruff style of this course. 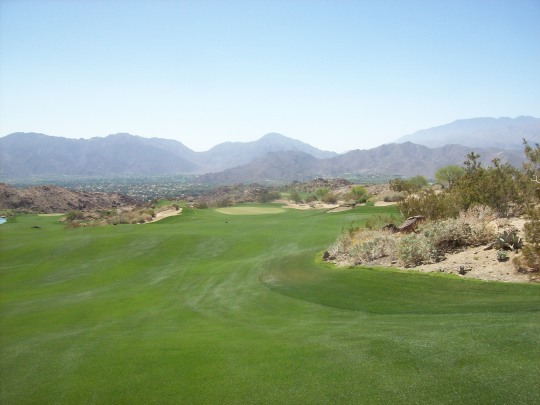 Though not “pretty” in a traditional Palm Springs kind of way, Stone Eagle offers a rugged beauty that will appeal to many and a pure design that feels like part of its surroundings. The only real “landscaping” here is a number of cacti and desert bushes brought in to maintain that rough and tumble feel amidst the giant boulders and craggy mountains. 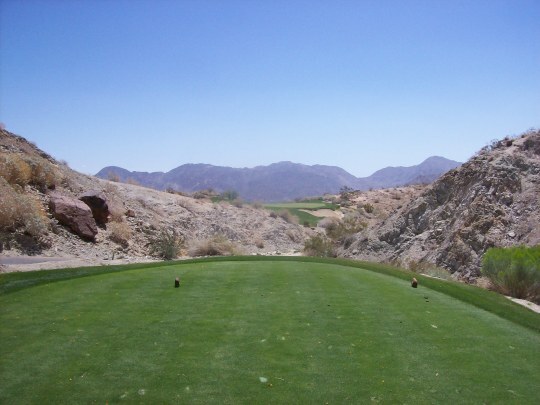 Stone Eagle is not necessarily a course everyone will enjoy, but it is something very different and I enjoyed it as much as I hoped I would. 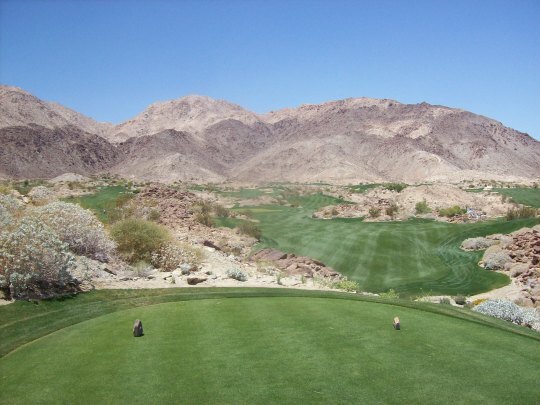 It is a unique golf experience and a bold design that I would love to play again if given the chance. I say “given” because I don’t know if I would shell out that much money to play here again (not even counting the forecaddie tip). But to anyone who does get a chance to play here, I would recommend it in a heartbeat.